Weekly Photo Challenge: The Sign Says – Travel. Garden. Eat. Always read the fine print . . .
Only 83 days until the Minnesota State Fair kicks off its annual eclectic extravaganza of food, animals, exhibits and entertainment! This post was in response to the Daily Post’s Weekly Photo Challenge. ”The Sign Says” was this week’s theme. Everyone is welcome to join in the Challenge; further details on how to participate and links to others’ responses are found here. 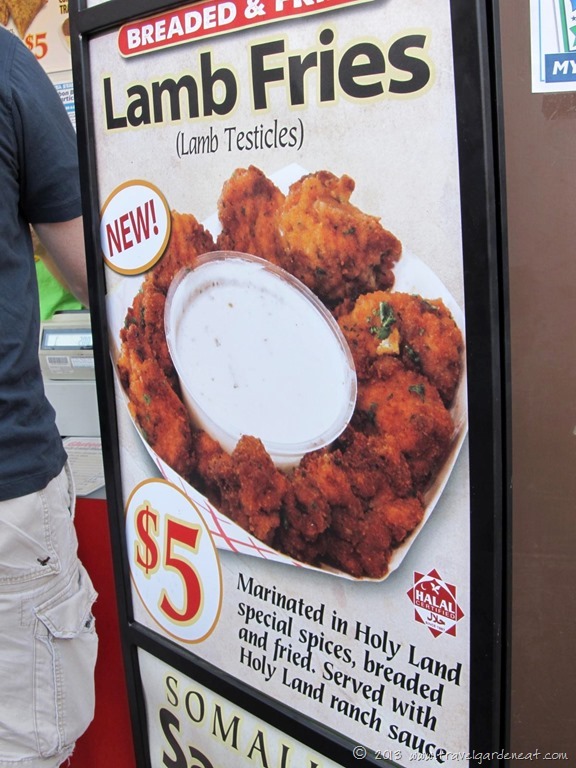 The lamb version of Rocky Mountain oysters, the same parts but of bulls. 🙂 They can actually be quite tasty. The State Fair is full of novel snacks! Everyone eats everything at the MN State Fair! They were a popular item, as they were one of the featured “new foods” publicized before the Fair opened last summer. OK. This sign has to be THEE best. Ever. oh wow, i don’t know if i’d have the balls to eat that. although if i did then i know i would be able to. well spotted! You need the rest of the year to detox from the one day of Fair food! Actually given our caloric intake on Fair day, we could probably fast the rest of the year. With so many other options, I passed on this one last time . . . Deep frying can camouflage much! Oh my! I don’t think I’d want to try those! This was a great take on the challenge though! Arrrrgh!!!! This actually made me stop, shudder and re-read the sign three times! Why is it necessary to eat a whole box of those things?!?!! Holy land spices indeed. Holy crap. Balls. I would have passed also, ick! !